Is it just me, or is this February chock full of contests and challenges? This is the 8th year of the contest. Yes, the open call for the 8th annual contest was back in December, but you can look through the top 16 magic items and vote on the current round if you have an account on the Paizo message boards. This Pathfinder-based contest hopes to develop new talent, and the design advice flying around the boards might help if you're stuck on designing a magic item. The winner gets to design (and get paid for) an adventure published by Paizo. It's a sweet gig for an unknown designer, and the top 4 usually end up getting some paid work. I submitted a couple of times and got some feedback, and then my editing work took off and I no longer felt the need to attempt validation in a huge cattle call. I've been half-waiting for a smaller, more sane competition in reaction to Paizo, and this year it's happening. You've got until Sunday 16 Feb 2014 at 1PM Eastern time to submit up to three innovative magic items designed for the Swords & Wizardry ruleset. Judges narrow the field to 8 qualifiers who get to design a monster, then the final 4 get to populate a provided dungeon map with an awesome adventure. No publishing gigs on the line here, but the winner gets bragging rights, $10 in DriveThru RPG credit, the OD&D Reprint boxed set, and $275 in cash via PayPal. New prizes will be added to the roster as they're donated. I've got one item just about ready to go, and if inspiration hits me for another couple of items, that'd rock. 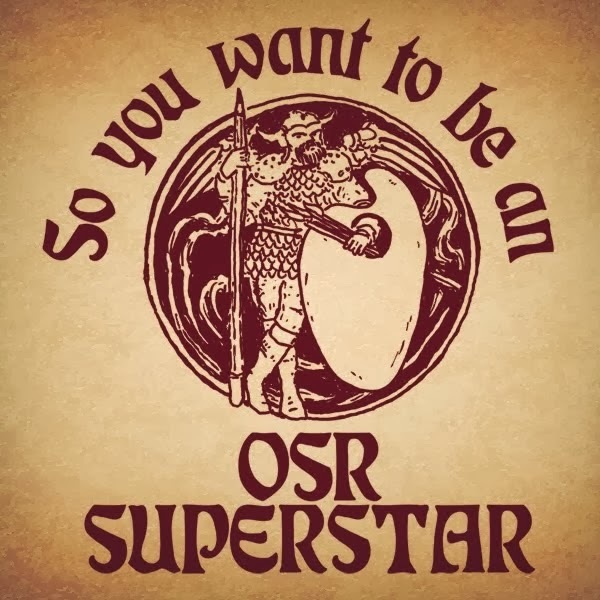 All submissions will be compiled and released in a free PDF for the OSR community to drool over and use in their home games. I have no idea how many submissions this contest will receive (70 submitted at this point, and Tenkar is hoping for 200), but the fact that it's organized by a few people ponying up a wad of cash to inspire the creation of cool things makes me want to support it. I'll see you after the first round gets judged. If you're into maps, have I got the contest for you. Just finish the provided partially-complete Dyson map and submit it for publication online at Dyson's Dodecahedron. You'll also be in the running for original maps and a copy of the Deluxe edition of Dyson's Delves personalized with an original, never-before-seen, hand-written adventure. You've got until Sunday 23 Feb 2014 at 23:59 Eastern time to complete the map and email it in. If you need some blog inspiration, you can run down this list of 28 D&D topics and write your heart out. It looks like a list of firsts from your past D&D experiences in any edition, culminating in "What's the single most important lesson you've learned from playing D&D?" It may be a little late to get on the official blog hop list, but a month's worth of blog topics can't be a bad thing. 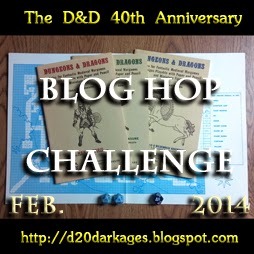 Reading 53 people's past experiences with D&D as an homage to the hobby could be downright cool as well. You've got until Wednesday 30 Apr 2014 to submit a system-neutral dungeon that fits on one side of a piece of paper (letter or A4). Past entries have been as much about art, layout, and page design as dungeon design, and they're very cool to look at and read through. If this tickles your fancy, start creating now so you can polish it before the deadline. This is not a contest to be half-entered. 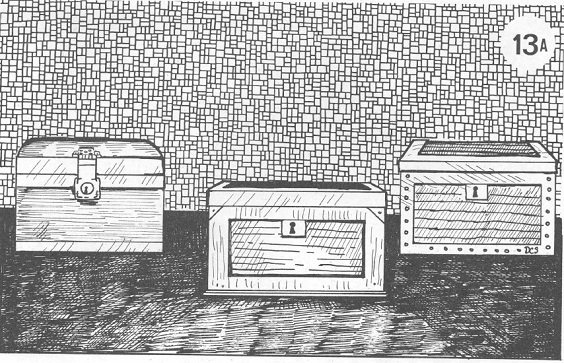 Donations of prizes from several publishers (Engine Publishing, Pelgrane Press, and Steve Jackson among them), publication of the winning dungeon in Gygax Magazine #5, and $500 cash up for grabs makes this a tempting contest to enter. So yeah, this February seems long on gaming contests. I'm also gathering links to future game contests. I'll cover those in a future post. If you're running a contest, please let me know and I'll plug it here. What contest are you looking forward to entering?